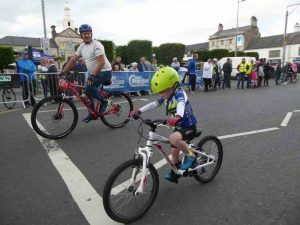 There was another great evening of criterium racing on a closed road circuit in Ards Town Centre last night. First up, as always, were the novices. 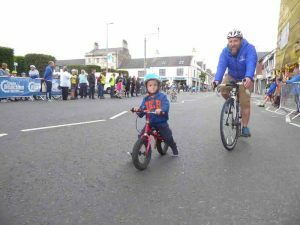 The 40 riders were split into 4 groups – balance bikes, 4-6 years, 7-9 years and 10-12 years – and competed over two laps. All riders received a goody-bag. There was also a prize for the proudest father…. Next up were the under 12s, with 24 riders racing over 4 laps. Seth Dunwoody (Shelbourne) and Aine Doherty (VC Glendale) quickly built up a lead over the others with Seth taking the win. Reuben Maitland (Kilinchy) was third and Lucy Brown was best unplaced girl. The 20 under 14 and under 16 riders raced together over 8 laps, with the U-14s getting a short handicap. The increased speed and group riding skills, compared to the earlier races, were clearly visible, and there was still a big group fighting it out for the finish. 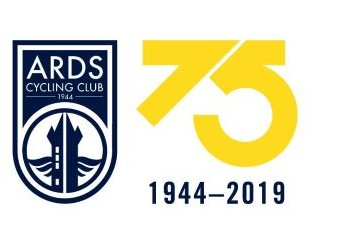 Unfortunately there was a bit of confusion due to duplicate numbers between U14 and U16 riders but it was eventually sorted out. The final results were as follows (thanks to all for their patience). The A4s were next, with 24 riders racing over 20 minutes plus 1 lap. 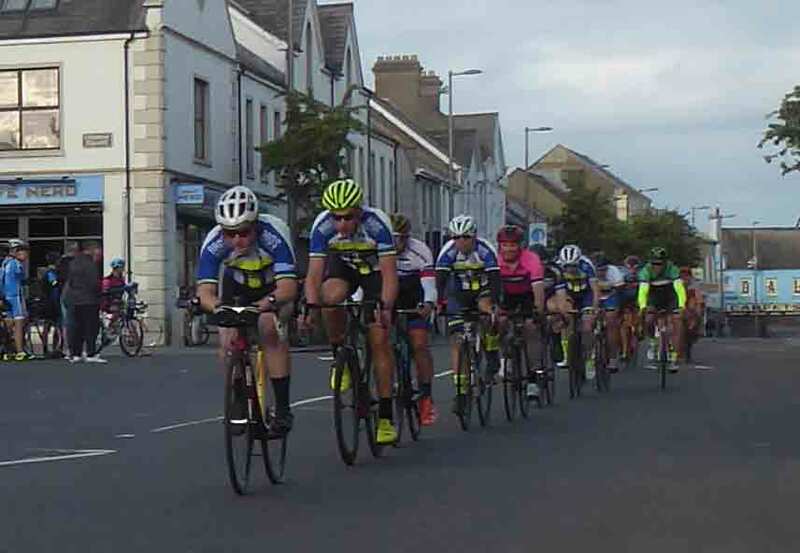 The Ards riders looked strong throughout, often riding at the front, and did the club proud. Final race of the night was the Senior 1, 2, 3 and Junior race over 40 minutes plus 3 laps. 29 riders lined up, with a healthy sprinkling of local stars and past winners. Top 3 on the night – looking tight and professional with 2 laps to go. The speed was visibly faster, with numerous attacks. First rider to really establish a gap was John Buller (Banbridge). After about 10 laps by himself, he was joined in the closing stages by Lindsay Watson (Powerhouse) and James Curry (VC La Pomme), but John still had enough strength left to take the win. 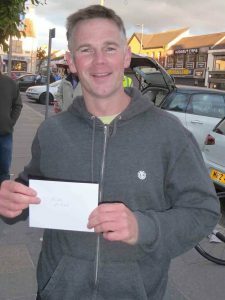 The bunch sprint was won by former Ards CC man Dale Walker – now making a comeback with Phoenix :-). 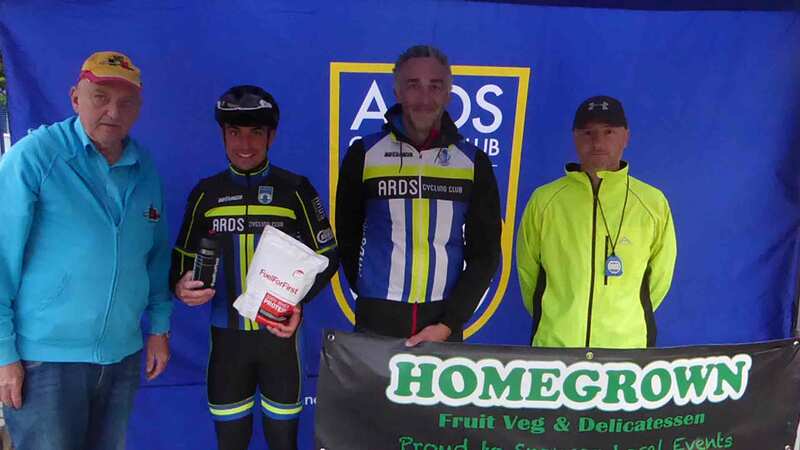 Ricky Topping (Ards CC) rode strongly in the exalted company, taking first unlaced A3, and top Ards rider. 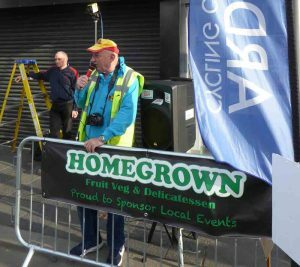 Club timekeeper Darren Colville makes sure that the top three prize winners know where to go for all their fruit and veg needs. All the marshals, judges, time keepers, sign-on, etc. It was great to see so many folk helping out. You were brilliant. The Commissaire Laura Wilson, who stayed calm while keeping us straight. Our photographers – check out the Ards CC Facebook page and www.belgianproject.cc. 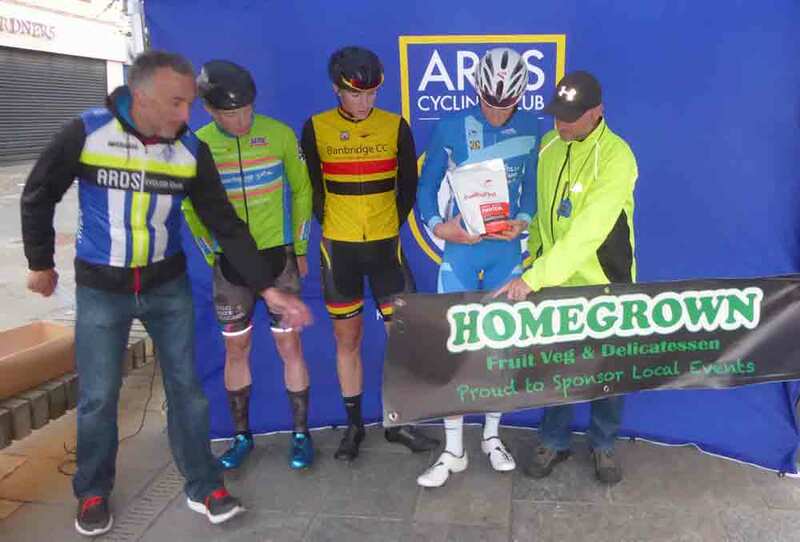 The sponsors – Home Grown Fruit and Veg, Wirefox, Chain Reaction Cycles and the Belgian Project. Dany for his knowledgeable commentary. And Cycling Ireland for photo finish. Gwen for the novices goody bags.